This Sunday's readings continue the theme from last week of discipleship. Last week, we learned that God is persistent in his call. This week, we see examples of how we can respond. In our first reading from the Book of the Prophet Jonah (3:1-5, 10), we hear about Jonah, who eventually heeded God's call to warn the people of the great city of Nineveh of their impending destruction. Jonah initially ran away from God's call, but God was persistent and brought him back. The people of Nineveh heeded God's warning through Jonah and were saved. The word of the LORD came to Jonah, saying: "Set out for the great city of Nineveh, and announce to it the message that I will tell you." So Jonah made ready and went to Nineveh, according to the LORD'S bidding. Now Nineveh was an enormously large city; it took three days to go through it. Jonah began his journey through the city, and had gone but a single day's walk announcing, "Forty days more and Nineveh shall be destroyed, " when the people of Nineveh believed God; they proclaimed a fast and all of them, great and small, put on sackcloth. When God saw by their actions how they turned from their evil way, he repented of the evil that he had threatened to do to them; he did not carry it out. 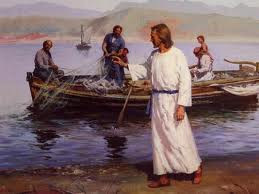 In our Gospel reading (Mark 1:14-20), Jesus called the fishermen Simon, Andrew, James and John to be his disciples. They immediately left their boats and their livelihoods and followed Jesus. It was through these simple fishermen and the other Apostles that Jesus built his Church. It was with the guidance and strength of the Holy Spirit that they had the courage and wisdom to follow in Jesus' footsteps. In our Epistle reading (1 Corinthians 7:29-31), St. Paul tells us how we should be detached from this present life, in expectation of the life to come, in God's time. This world is temporary, passing away. The world to come is for all eternity. A good reflection might be to ponder what it was about Jesus' call that moved the first disciples to immediately leave their boats to become "fishers of men". They experienced that call in the person of Jesus, eye to eye, face to face. What an overpowering moment that must have been. Jesus calls each of us to a life of ministry of some type. How do we respond? Like Jonah who initially ran away? Or do we heed St. Paul's urging of detachment, being free to follow the call, wherever it leads us.